The head's structure may not explain as much about an animal's posture as long believed. New research could call into question the link between humans and their possible ancestor, Sahelanthropus tchadensis, pictured above. (Inside Science) -- How can you tell how a creature walked when all that you have is the head? For many years, scientists looked to the foramen magnum -- the large hole at the base of the skull where the brain connects to the spine -- to find out. They believed it showed if an early human was a biped that walked on two legs, or a quadruped that walked on four. But a recent study published in the Journal of Human Evolution calls this into question. "People thought the foramen magnum was related to upright walking because of balance," explained Aidan A. Ruth, a biological anthropologist at Kent State University in Ohio and the study's lead author. Unlike humans, chimpanzees typically move on four limbs, so their foramen magnum sits near the back of the skull. But in upright-walking humans, the hole is at the bottom. This lets the head balance on the spine like a golf ball balances on a tee, Ruth said. To test this theory, Ruth and her colleagues examined three groups of animals: rodents, marsupials, and strepsirrhine primates like lemurs. Some animals in each group walk on four limbs, like koalas, while others use two, like kangaroos. A previous paper by Gabrielle Russo and Chris Kirk of the University of Texas at Austin compared bipeds and quadrupeds in these same groups. Their research seemed to confirm that foramen magnum position could predict whether an animal was an upright walker, or a quadruped. But Ruth suspected the hole's position was influenced by more than how an animal moved around. "Look at short-faced animals like koalas. They have these huge chewing muscles that make their faces really wide, and that could throw off measurements," said Ruth. Instead, her team looked at the angle of the foramen magnum -- which could show the direction the spine leaves the head. Then, like Russo and Kirk, Ruth compared the differences between animals that moved on two legs and animals that moved more on four. The results were surprising. Once factors like skull shape were taken into account, Ruth found no correlation between foramen magnum angle and the way an animal moved. David Strait, a physical anthropologist at Washington University in St. Louis, has also studied the way the foramen magnum relates to walking. He thinks these results are interesting, but not necessarily unexpected. "The foramen magnum might tell you about how the neck is held, which might tell you about how the trunk is held -- but there's a chain of inferences from the bottom of the skull to locomotion, and each time you have to infer, your argument gets a little weaker." The pelvis, knee, and foot bones can tell us a lot more about how an animal moved, he explained. If the relationship between the foramen magnum and locomotion has always been a bit murky, why is so much significance placed on it today? "It starts way back with Raymond Dart and a skull he was given in 1924," said anthropologist Jeremy DeSilva of Dartmouth College in Hanover, New Hampshire, who studies primate locomotion. At first glance, the skull looked like a chimp's, said DeSilva. But there were a few differences -- the most telling was the centrally positioned foramen magnum. Dart concluded that the skull was from a biped. "And because true bipedalism is unique to the human lineage, connecting the dots between the anatomy of the head and how something walks was an important part of his research," said DeSilva. Today Taung child, as the fossil came to be known, is recognized as the first specimen of Australopithecus africanus, an ape-like biped. Additional fossils cemented Taung child's position on our family tree – and the foramen magnum's in paleoanthropological dogma. Recent fossil finds have renewed the debate over the foramen magnum. "The elephant in the room," explained DeSilva, "is Sahelanthropus." Sahelanthropus tchadensis is 7 million years old – which means it lived around the time humans and chimpanzees split apart. 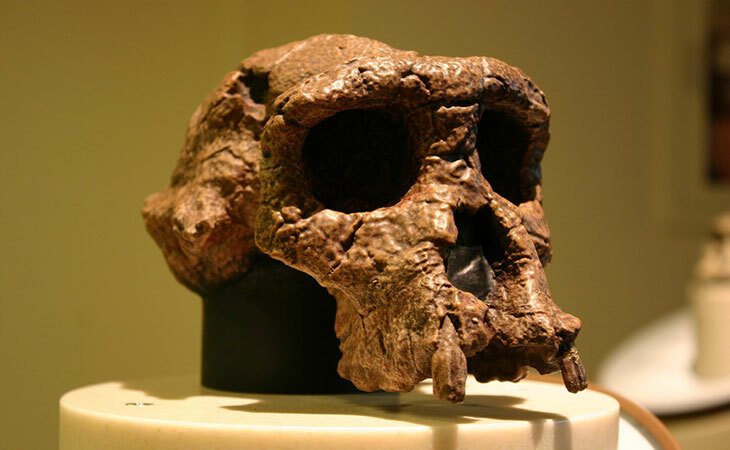 Because the most complete fossil is a skull, the foramen magnum is one of the best pieces of evidence linking Sahelanthropus to the human lineage. The conversation over the foramen magnum's importance is far from over. "The authors present interesting results that raise many questions," said Russo of Ruth's paper. "My colleagues and I are working on testing hypotheses related to those questions, and we look forward to continuing this dialogue with Ruth, Lovejoy, and others about the foramen magnum." Paleoanthropologist John Hawks of the University of Wisconsin, Madison is excited to see how the debate unfolds. "Ruth's paper and others have taken away the clear idea that we know what the posture of these animals was like. Some people thought the foramen magnum was the feature that shows locomotion. Maybe it's not," he said. For now, maybe we shouldn't take the holes in our head at face value. Erin E.A. Ross is a science writer based in Santa Cruz, California.